When workload demands shift unexpectedly, the CK71 gives you the flexibility to redeploy staff without consideration to the tools needed to get the job done. As a result, workers can quickly and confidently transition to tasks that require near or far scanning, and more. Contact us today about buying, servicing, renting or selling Intermec CK71 gear! 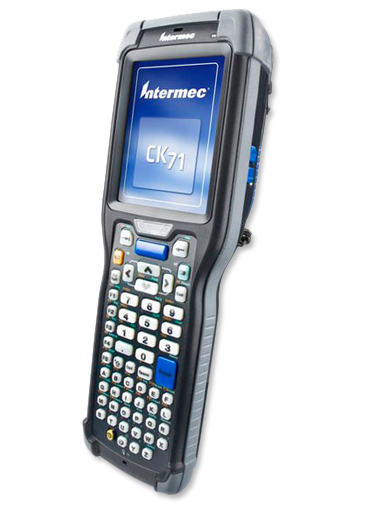 Intermec is the first to offer a no-compromise solution with the CK71 ultra-rugged mobile computer. In addition to being 31% smaller and lighter than other form factors in its ultra-rugged class, the CK71 is optimized for your warehouse and distribution environments with premium, industrial grade materials for the perfect balance of ruggedness and duty cycle along with next generation features that focus on enabling flexibility and agility, even in the most extreme conditions. Contact us today about buying, servicing, renting or selling Intermec CK71 gear! People, who are looking for a mobile computer that fulfills their requirements, then this new Intermec CK71 is only made for them. With the outstanding aspects, this new device has acquired a lot of success in the market. It includes several features and communications options that always keep your team in contact and also helps in working effectively throughout the whole day and night. Moreover, it’s lighter as compared to other leading devices in the ultra-rugged lineup.